Two years ago, my Dad played his harp for the Battle Ground Art Alliance’s Annual Spring Show. An artist named Linda McCord took his picture playing the harp. Just a few days ago he received a message that this artist had painted him and wanted to give him a print of the painting. But he would have to go to Longview to her Gallery to pick it up. As it turned out, I was heading to Longview for a root canal the very next day. 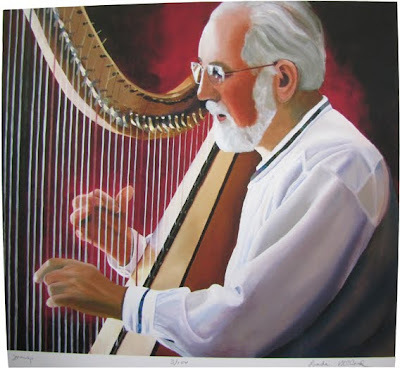 As I walked into the Gallery, just five minutes from the dentist, the first painting just inside the door was a beautiful image of my father playing his harp. This was part of a group of musicians, “Sax”, “The Guitarist”… And Dad’s is simply called “Strings”. I had a nice conversation with the artist, and found that we had some things in common. This is just one example of the serendipity I find in everyday life. I have noticed that the more you recognize and appreciate the serendipity and synchronicity in your life, the more you will experience.